Last night we heard a fantastic concert featuring two very different groups from East Africa - Mombasa Party, from "Kenya Mombasa" (as the band said), and the Royal Drummers of Burundi (pictured above). Mombasa Party opened the show. A small ensemble featuring a harmonium, a bass guitar, a guy playing the bongos, and a singer, Mombasa Party played songs in the Taarab style. I haven't been able to learn much about Taarab - it seems to be an East African fusion of indigenous music with influences from Arabia and Europe. Some of the songs were decidedly African in flavor; others were reminiscent of Spanish tunes - it was a very diverse set, yet clearly united by a common style. Their last song included as a refrain the phrase "hakuna matata," which I first heard in the eponymous song in Disney's The Lion King. It is a Swahili phrase, sometimes translated as "no worries." Their set had a lot of energy and was completely fun. When Mombasa Party finished their set, a dozen strong men clad in outfits reminiscent of togas suddenly appeared on the stage and took their places behind large drums that were arrayed on the stage. 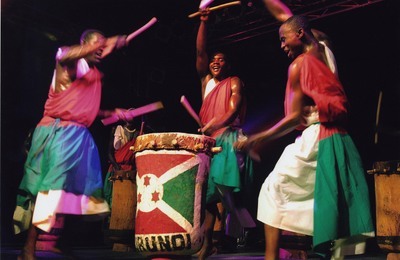 These were the Royal Drummers of Burundi. When they started playing, the sound and the sight were awesome. They wielded long thick mallets and hit the drums harder than I've ever seen drums hit, in perfect unison. The wave-like effect of their mallets arcing up through the air and slamming down on the drumheads was awesome. The Drummers of Burundi gave us only a taste of what they had to offer, and then took their drums off the stage for the intermission. At the start of the second half, they came back out on the stage beating their drums which they carried on their heads. These are not small, delicate drums. They were enormous hollowed-out tree trunks, standing 3-4 feet in height. Stretched over the tops were untanned animal hides, held in place by a ring of thick, wooden pegs. The drummers carried these on to the stage and set them down to continue their show. Their rhythms were not complex, but they were driving and tight and loud. And instead of drum solos, they performed dance solos. There were more musicians than drums, so at any time there were anywhere from one to three men dancing energetically in front of the ensemble (and sometimes one having a rest in the wings! ), in the incredibly athletic African style that featured lots of jumps, kicks, and high steps. It was an awesome experience. I felt that the ceremonial origins of the drumming were palpable; despite the unreal decibel level, the rhythms were still trance-inducing. Mombasa Party and the Royal Drummers of Burundi are touring together and I think there are still a number of dates left. If you get a chance, I highly recommend that you see them.